The Mizoram Government on Monday constituted an interim Sinlung Hills Council as per the agreement signed between the State Government and the Hmar People’s Convention (Democratic) on April 2, 2018. HPCD spokesperson Lalthalien will head the new council as its Chief Executive Member (CEM). Mizoram Home Minister Lalzirliana said earlier that an interim council would be formed for six months after which election would be conducted. LT Hmar is named the chairman of the council and Lalbieknung will serve as his deputy. As per the agreement, the general council would consist of 14 members, of which 12 will be directly elected and two will be nominated by the Government. A total of 12 members were appointed by the Mizoram Home Department on Monday. “The Deputy Commissioner of Aizawl district will convene a council sitting within 30 days, the interim council will be in place for six months,” the government order said. The council will have executive power to formulate plans, schemes, budget, make bylaws and rules and impose, levy and collect taxes within its area. The council area will be divided into 12 constituencies and it will receive funds directly from the State Government. After a deadlock in 2013, the Mizoram Government and HPC (D) revived peace talks in August 2016, which culminated in the signing of the memorandum of settlement on April 2 this year. 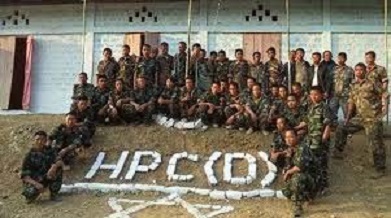 Altogether 114 HPC (D) leaders and cadres laid down arms in a homecoming ceremony on April 13 at Sesawng village near Aizawl. Lalbieknung; Dy Chairman – Lalthlamuana Hmar – executive member; Darliensung Ralsun – executive member; JC Zairemkunga – executive member; Melody lalchhuangzeli – executive member; Rohringa Hmar – member; Benjamin, member; B Lalthachhunga – member and Lalremruata Varte – member.